When you look back in history, there might not be another year in US Mint history as significant as 1916. In the midst of the mint’s overhaul of American coin design, three iconic new designs debuted that were influential in a period known as the Golden Age of American coin design. 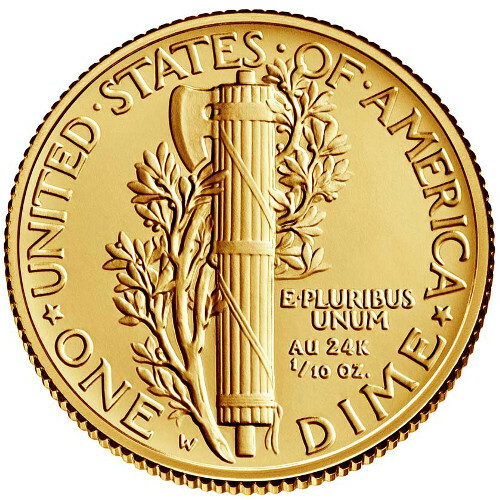 Today, the 2016 1/10 oz Gold American Mercury Dime Coin is available as a near-perfect specimen from Silver.com. More and more often investors are buying gold in fractionals to meet their needs because of their divisibility. Spot price of gold changes frequently, but can always found using our on-site charts. First release of the Gold Centennial Coins from the US Mint! Issued a face value of $.10 (USD) by the United States government. Bears a grade of Specimen Proof 69 from the Numismatic Guaranty Corporation. Early Release label. Features the West Point Mint’s “W” mint mark. Obverse includes the Winged Liberty design. Reverse bears the Roman fasces. The United States Mint only recently released its first-ever 24-karat gold coin in 2006 with the introduction of the Gold American Buffalo coin. Now, the Gold Centennial Coin series celebrating the 100th anniversary of three iconic coin designs will more than double the number of 24-karat coins from the US Mint. Adolph A. Weinman’s 1916 design of a Winged Liberty figure featured originally on the nation’s ten-cent piece, replacing a design that originated in 1892 from US Mint Chief Engraver Charles E. Barber. Weinman’s dime design remained on the nation’s currency until 1945, when it was replaced with the image of President Franklin D. Roosevelt in the wake of his death in office. 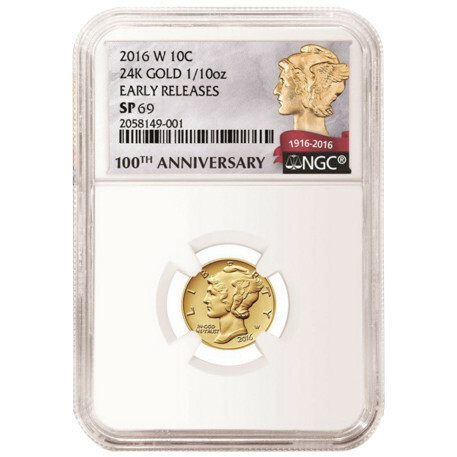 The 2016 1/10 oz Gold American Mercury Dime coins available here today have Specimen Proof 69 grades from the NGC. SP69 coins have proof-like finishes, full, original mint luster, and a maximum of two minor detracting flaws. As an Early Release specimen, these coins were received by the NGC within the opening 30 days of sales for the coins as set by the US Mint. 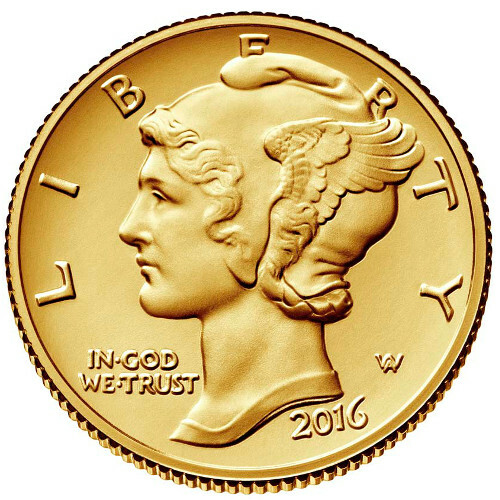 On the obverse face you’ll find Weinman’s original Winged Liberty design, accompanied on the reverse by the Roman fasces design. Each coin arrives with a special 100th anniversary label from the NGC, identifying the centennial celebration and striking of these coins. Please feel free to contact Silver.com with questions about these coins. You can reach a Silver.com associate on the phone at 888-989-7223, online using our live chat, and via email.